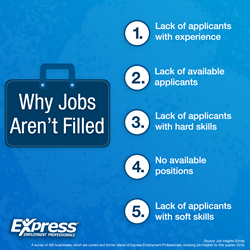 New survey from Express Employment Professional reveals companies are having a hard time filling open positions. Chris Ashcraft, who runs an Express Employment Professionals office in Mobile, Alabama, says it’s getting harder to fill jobs in his area. Unemployment is hitting new lows, meaning fewer workers are available. “Right now, we are trying to recruit employees into the area from outside,” he said. In Grand Rapids, Michigan, Express office owner Janis Petrini notes, “We have full employment, and so companies are having to be creative about how they will tackle the shortage of labor.” Despite the challenges, she’s optimistic. “The community partners have come together to talk about innovative and creative ways to train and cross train the workforce,” Petrini added. In a recent survey of businesses from Express, more than three-quarters of respondents said it was “difficult” to recruit and fill positions, more than in any of the previous four quarterly surveys. When asked why jobs are not filled, 37 percent said “lack of applicants with experience,” and 31 percent said “lack of available applicants.” Other top concerns include applicants without the relevant hard and soft skills. The survey of 462 businesses, which are current and former clients of Express Employment Professionals, was conducted in December 2017 to gauge respondents’ expectations for the first quarter of 2018. Robert A. “Bob” Funk is chairman and chief executive officer of Express Employment Professionals. Headquartered in Oklahoma City, the international staffing company has more than 790 franchises in the U.S., Canada and South Africa. Under his leadership, Express has put more than 6 million people to work worldwide. Funk served as Chairman of the Conference of Chairmen of the Federal Reserve and was also the Chairman of the Federal Reserve Bank of Kansas City. Express Employment Professionals puts people to work. It generated $3.3 billion in sales and employed a record 540,000 people in 2017. Its long-term goal is to put a million people to work annually. For more information, visit ExpressPros.com.